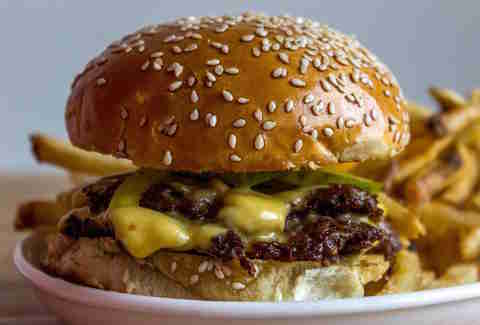 What you're getting: The “Wimpy Plate” Inspired by the burger-loving Popeye cartoon character Wimpy, this mammoth plate features a juicy triple BOCADO Burger stack with American cheese, perfect house-made pickles, and a soft, buttery bun on one plate. Three times the BOCADO Burger stack? That’s what we’re talking about. FYI: it’s also available at BOCADO in Buckhead! What you're getting: Massaman curry fried flounder ATLiens already know that some of the city’s very best Thai and Chinese dishes get cranked out here, but not everyone knows about the massaman curry fried flounder. 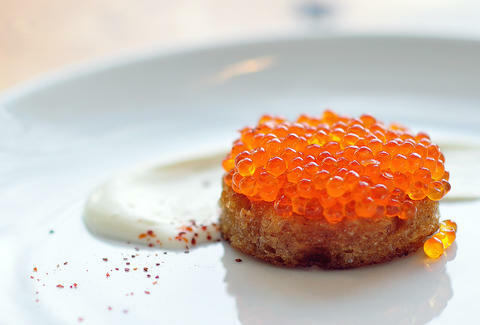 Once something featured on the specials board, it remains a viable favorite for those who know to ask. What should you expect? Only the most flavorful, perfectly fried, flaky fish in a rich, creamy curry sauce. You’re welcome. 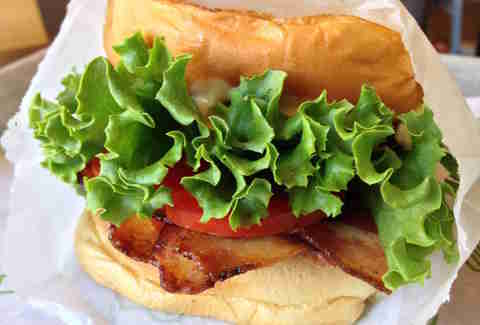 What you're getting: The Shack BLT You already know Shake Shack makes killer burgers, but you probably didn’t know that it also cranks out one seriously legit BLT. Boasting thick, smoky bacon with zesty Shack sauce on a buttery, toasted, and inverted potato bun, it’s almost hard to believe something so simple can be so fantastic. But then again, BACON. What you're getting: Mojitos and pisco sours There was an almost palpable sadness in the city when Chef Hector Santiago’s original Super Pan Latino Sandwich Shop closed a few years back, but now that it’s coming back to the Ponce City Market you can once again order the same incredible Latin sandwiches and small plates that made the old spot so beloved. Just be sure to order at least one each of the unlisted classic cocktails to go with ‘em. What you're getting: The FrankenVeggie Sure, We Suki Suki gets a ton of hype for its classic bánh mìs. 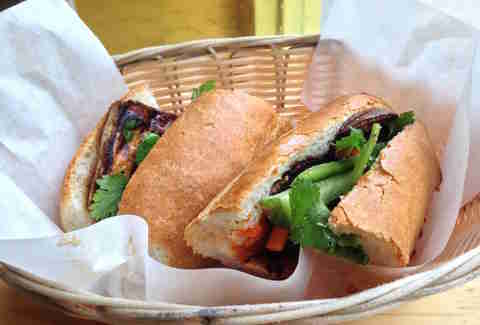 And a bite of the FrankenVeggie, a hybrid of the tofu and eggplant bánh mìs, proves it deserves pretty much all of it. By stuffing half the baguette with the most... err, maybe the first eggplant you’ve ever tasted, and the other half with tofu that’s actually delicious (also the first you’ve ever tasted), you might even be surprised when you start ordering it on the reg. What you're getting: The Cowboy burger Boasting a huge all-beef patty cooked however you like, this burger is topped with seared ham, smooth provolone, and a sweetly spiced barbecue sauce. Make sure to leave room for the French fries or onion rings that’ll bust your zipper if the burger hasn’t already. Pro tip: grab some extra napkins -- it’s incredibly messy and entirely worth it. 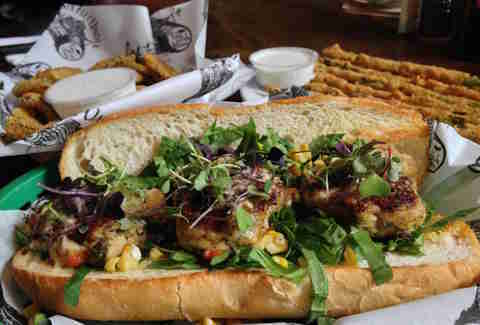 What you're getting: The crab cake po-boy, fried pickles, and fried asparagus Kudos aplenty have been bestowed on Six Feet Under, and this also extends to its off-menu dishes. Once you taste the hearty crab cake po-boy stuffed with succulent crab cakes, fresh spinach, corn, and a spicy mustard sauce, you’ll think it can’t possibly be any better. 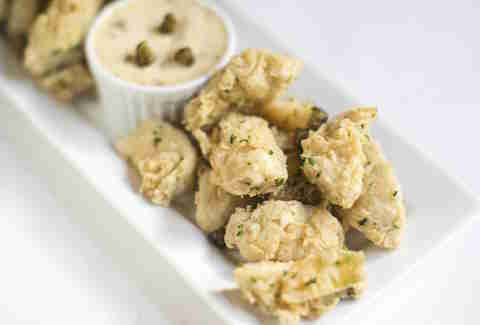 Then you'll try the fried pickles and asparagus and know you were wrong. Oh, and once you’ve polished all this off, head on up to the rooftop patio and enjoy the view and a cold one. What you're getting: South African biltong and droewors The original 10-spice biltong at 10 Degrees South is outstanding, but each night the kitchen has at least three hidden flavors your server may not initially tell you about, but you should most definitely ask for: teriyaki, garlic, and peri-peri. Also, ditch the menu’s boerewors and definitely opt for droewors, an air-dried version of the popular lean beef spiced sausage. All cut, cured, and seasoned in the kitchen, these dishes are not only mind-blowingly good -- they’re great for impressing your date, too. 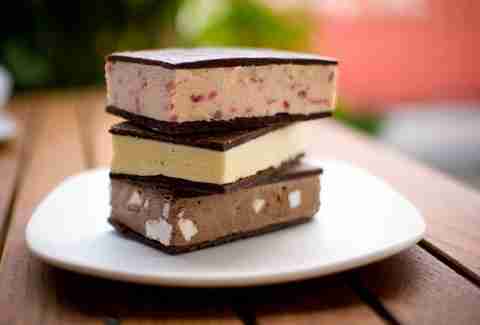 What you're getting: Ice cream sandwiches Served only during lunchtime, you won’t find these treats printed on the menu, but the kitchen has at least three flavors on hand for hungry Atlantans in the know. Lovingly made by hand using seasonal ingredients and featuring flavors such as toasted almond, peach, and peppermint, these frozen treats are seriously gourmet and seriously good. Not that we’d ever order all three and just call that a meal. Sign up here for our daily Atlanta email and be the first to get all the food/drink/fun the ATL has to offer. Brook Bolen is a freelance writer from Atlanta who aspires to eat her weight in FrankenVeggies from We Suki Suki. Don’t believe it? Check out her Instagram for proof.